A few months ago, Xiaomi and Mi Philippines announced that they will be returning to the Philippines after a long hiatus. The comeback was highlighted by the grand opening of its first official store at the TriNoma Mall in Quezon City last February 17, 2018. Mi Philippines also revealed plans to open official stores in Lazada and Shopee. Today, Xiaomi announced the opening of its official Lazada store. The company also announced the release of its affordable budget phones, the Redmi 5A and the Redmi 5 Plus. 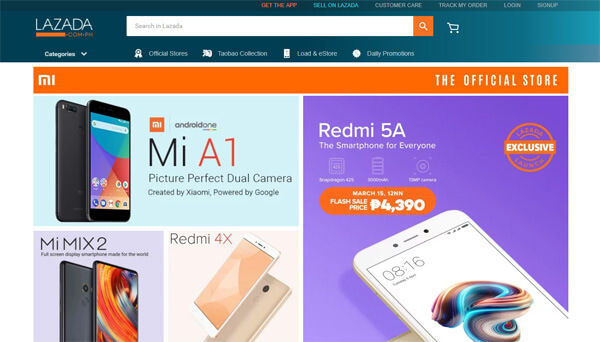 Although Xiaomi phones and devices have been available for purchase in Lazada for a long time, this is the company’s first foray into local e-commerce marketplace. As of this writing, there are only 5 phones available at the Xiaomi official Lazada store. These are the Mi A1, the Mi Mix 2, the Redmi 5a, and the Redmi 4X. We can expect more items to be added in the following days and weeks. So if you want to buy a Xiaomi phone straight from the company itself, do check out the Xiaomi official store here. Take note that some items are not yet available for purchase even though they’re already listed in Lazada. For instance, I checked out the Redmi 5A and was greeted by a “Coming Soon” sign.